Every Saturday, I host a feature called Kid Konnection -- a regular weekend feature about anything related to children's books. This week, I'm going to share with you an inspiring picture book that's certainly timely for the upcoming Martin Luther King Jr. holiday. Summary: Emmanuel Ofosu Yeboah's inspiring true story—which was turned into a film, Emmanuel's Gift, narrated by Oprah Winfrey—is nothing short of remarkable. Every so often, I run across a picture book that is truly spectacular. That's exactly how I felt after reading EMMANUEL'S DREAM: THE TRUE STORY OF EMMANUEL OFOSU YEBOAH by Laurie Ann Thompson and illustrated by Sean Qualls. There is no doubt that this is a beautiful book with an inspiring story. However, that the story is true makes it all the more special in my mind. EMMANUEL'S DREAM tells the story of Emmanuel Ofosu Yeboah. He was born in Ghana, West Africa with a deformed leg. Many people felt that Emmanuel would be useless and some even thought he was cursed, but his mother truly believed in her son and encouraged him to never give up. Emmanuel took his mother's wisdom to heart and, as a boy, he hopped to school more than two miles each way, learned to play soccer and even ride a bike. At 13 years old, Emmanuel left home to get a job and provide for his family. He continued riding a bike and eventually became a cyclist. In 2001, he rode 400 miles across Ghana and proved to everyone that a disability won't stop him... or others. Today, Emmanuel continues to share his powerful message. 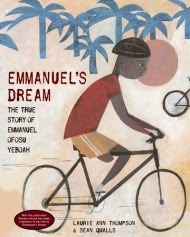 EMMANUEL'S DREAM is a wonderful book that should be in every elementary school library! I loved the inspiring story of Emmanuel and it definitely warmed my heart... while also making me shed a tear or two. Not only was the story amazing, but the illustrations were gorgeous. Sean Qualls is an acclaimed illustrator and has received a Coretta Scott King Illustrator Honor Award. I guess I've been living under a rock, but reading EMMANUEL'S DREAM was the first time I had ever heard of Emmanuel Ofosu Yeboah. His story was made into a film called Emmanuel's Gift which was narrated by Oprah Winfrey, and Emmanuel is a national hero in Ghana. It's no wonder because his story is truly incredible. Included in the back of the book is an author's note which goes into more detail about Emmanuel's accomplishments. His political activism encouraged the Ghanaian Parliament to pass the Persons with Disability Act and he also maintains a scholarship fund to help children with disabilities attend school. What an amazing man! I would love to see more books like EMMANUEL'S DREAM presented in our schools. Fortunately, there is a CCSS-aligned curriculum guide which is available here that can help teacher's present this story to their students. EMMANUEL'S DREAM is a very special book and I truly can't rave enough about it. Highly recommended! Giveaway alert: I have a copy of EMMANUEL'S DREAM to share with one lucky reader. To enter, just fill out the form below before January 30th at 11:59 p.m. EST. I will randomly select and notify the winner the following day. This contest is open to those of you with U.S. addresses only. Good luck! Wow, what an inspiring and amazing story. Sounds like an amazing story. I hadn't heard of him either! Like you, I've never heard of Emmanuel - now I want to read the book and see the movie. Can you imagine hopping 2 miles? Wow! I've never heard of Emmanuel either but this story sounds truly amazing. Julie, thank you so much for hosting the Emmanuel's Dream blog tour today! I'm so glad you enjoyed the book. 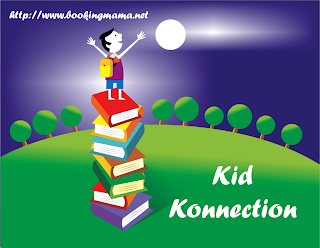 Thank you for Kid's Konnection - always fun to participate!